Students shall remove their shoes in the entrance area upon coming to the studio. Be courteous put shoes on shelf . The waiting area and training floor must be kept clean and all personal items kept in changing rooms. Students are responsible for their own valuables. Sparring gear must be marked with their identification (their name). No jewelry is to be worn while in training. Belts tied close to waist, not dangling down legs. Practice good hygiene. Fingernails and toenails must be short also. Upon entering the training floor, students shall bow to flags and to the instructor in charge. Bathroom breaks are highly discouraged after class is in session. Make time for yourself before class begins to use the bathroom and changing room. Be prepared to start class on time. No kicking bags is allowed without permission from the instructor. No running, jumping, wrestling, or horseplay before or after class. Students who arrive while another class is already in session are only allowed to wait by the main entrance to the work out area. Students are expected to be quiet and show respect to fellow classmates. Any one under the influence of alcohol or drugs will not be allowed to participate in class and will be asked to leave. No one is allowed to chew gum, eat, drink, or smoke inside the studio. 3. Join the class with a bow. Students must follow the direction of all instructors and interns. Proper respect and discipline must be maintained at all times. Discourtesy, rowdiness, brawling, vulgarity, stealing, or any other destructive behavior will not be tolerated. Visitors, friends, or relatives are welcome to observe class, but are discouraged to attend on regular basis. Students are not allowed to participate in any sparring without instructor permission and full sparring gear is mandatory. The office area is reserved for students and the instructors to discuss personal business. Though you are welcome at any time to visit the office, please observe the need for the office to be used for these purposes. Don’t forget to knock! There seems to be a trend occurring in the martial arts in this country which is breaking with the traditional and time honored methods of achieving success in the martial arts. Perhaps it is a reflection of our cultural identity of rugged individualism and our tradition of encouraging people to determine their own futures, but it does not mesh well with the proven methods of mentoring martial arts students. There are many traditions in the martial arts. We wear a uniform, we recognize progress and achievement through a system of colored belts, we show respect to each other, we bow to our nation’s flag…the list goes on. These traditions serve a purpose. Many of our traditions can easily be seen as fulfilling the “golden rule”…treating others as we would have them treat us. In addition, these traditions help instill discipline in our students. To what end do we desire this discipline? It is an essential element in the process of training and learning to respond to a situation. This discipline allows us to instill behavior patterns that may well one day save a student’s life. Another tradition in the martial arts, is the respect shown to the Master of the school. In a reputable school, the Master is a master in the true sense of the word. He or she has trained for years under other more senior masters and has been tested and tempered to a fine edge. He has learned from the best, and is now passing that knowledge on to his own students. In the past, students often did not seek out the Master, but rather were invited by the master to enter into the master/student relationship. The young person interested in the Master’s methods could be found observing training, perhaps offering to do work for the Master and in other ways making themselves available. It would have been considered extremely rude for such a person to presume to invite themselves to begin training. It was up to the Master to observe such a person, and when they felt them to be ready to begin training, to invite them to do so. In our modern times that would be rather impractical to follow this tradition. It is not impractical, however, to show the same respect for the judgment of the Master. When a student first seeks to enter martial arts training, they must search out an instructor in whom they have confidence. During the first interview, there should be a rapport established. It should take only a few minute to determine if the student has made the right choice. Once the student has committed to the (Dojang) school, they must trust the Master to fairly and correctly make judgments concerning their progress. Pick up any introductory book on the martial arts, and you will read that the student must never question the Master concerning their progress. In a traditional (Dojang) school, a student should never question the instructor concerning belt promotions. If the student trusts the instructor enough to participate in the training program, they should trust the instructor enough to make the proper judgments as to when each student is ready to test for the next promotion. This said, it should be apparent that as the Master instructor, it is my responsibility to determine when a student will test. Lately, I have had to spend valuable time in discussions with students and parents concerning when they should be testing. In this article, I will explain the testing policies at our (Dojang) school. There are three things which I assess when deciding when a student will test. All three are equally important, and a lack in any one of them will delay the time at which a student will test. It is not enough to show excellence in only one or two of these areas, all three must be fulfilled. *attendance- attendance is mandatory. For color belts, students should attend class two times per week. In general, it takes a minimum of 3 months and 4 stripes. Each stripe represents a part of the curriculum (forms, combinations, eurhythmic beat, step sparring, and self defense). 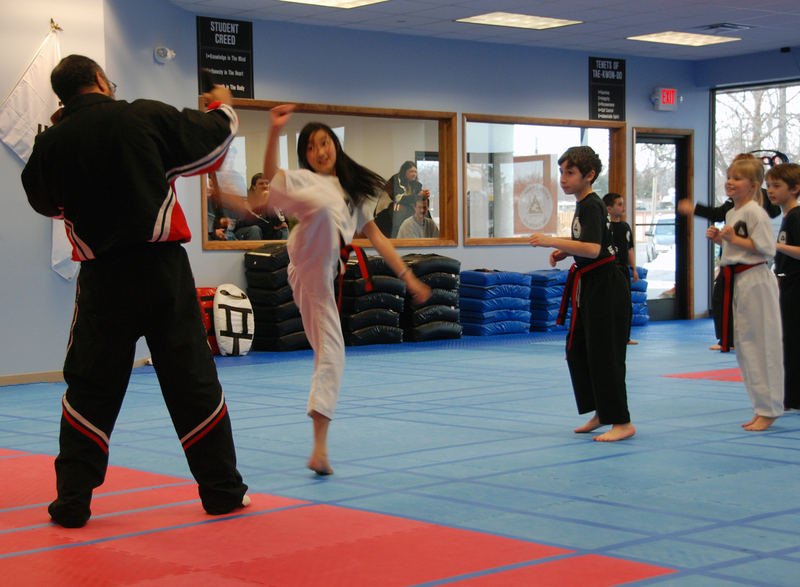 The lower color belts testing are based on their abilities and can take up to six months. The first earned stripe is to know your new belt form. The second stripe earned is to know your new belt combinations, with accuracy. The third stripe is for knowing all the color belt forms, with good stances. The fourth stripe given is for the student to know all the fighting combinations for the belts they already tested in. Black belts should attend their classes offered twice a week. They should choose one class they intern/teach once a week, this is a minimal requirement. To intern they need to attend the leadership training program offered to all belts. For optimal training, learning proper techniques, keeping up on skills, advancing, and maintaining conditioning, black belts should attend any or all classes offered at the school. Consistency is a challenge and so is giving what you have to others. Communicating and speaking with and to others is a skill within itself. 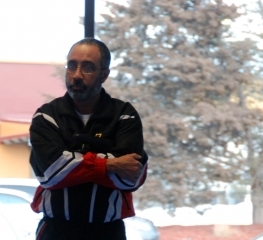 Developing patience comes in teaching; black belts should be ready for these challenges. Students, junior and senior, listening to a black belt, have to be able to understand their directions. The black belt, under the supervision of a Master instructor, need to give, under the method of teaching, to develop someone else’s abilities. This is our program at the school and the students’ future. The teaching of the tenants, for black belts, comes not from what they have attained for themselves in earning a black belt, but what they will be giving to others. In general, it takes six months to a year to confirm for 1st degree, and then an equal number of years to test for each Dan. For example, two years as a first Dan before testing for the second, three years as a second Dan before testing for the third, etc. Testing for stars occurs at evenly space intervals between the degrees. This is not to say that students who cannot achieve this level of attendance have no place in our school, but it must be understood, that a less frequent training schedule will result in the testing being delayed for months or even years. These attendance requirements are important. There is simply no way for a student to master the techniques he must without the day to day work in class. Testing requirements and testing times for individual students are subject for further discretion by Master Angel. *mastery of material- This involves both physical and mental mastery. 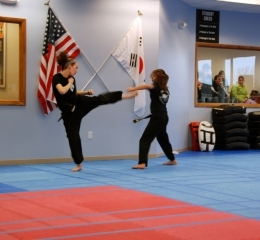 The student must show proficiency in all techniques required for their belt level including kicks, punches, jumps, etc., as well as mental mastery of things such as memorizing the forms, combinations, Korean terminology, theories of power, tenants, etc. In judging when the student has achieved the desired goals, I evaluate each student within his or her own ability and potential. I recognize that some students will face more challenges than others in certain areas. Students are not compared to each other, but rather compared to their own previous level of mastery and progress since their last test. *attitude- The student’s attitude is the final factor in the equation. Attitude is extremely important. 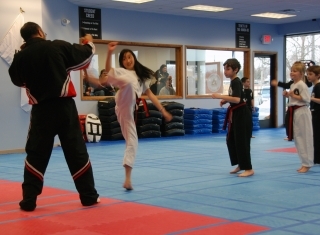 A student could have attended enough classes, have mastered both the physical and mental challenges for the next belt test, but still be lacking in attitude. A student who is performing at the minimum level, but who is capable of a much higher performance, will not be deemed ready to test. The students must put forth consistent A+ effort in class. 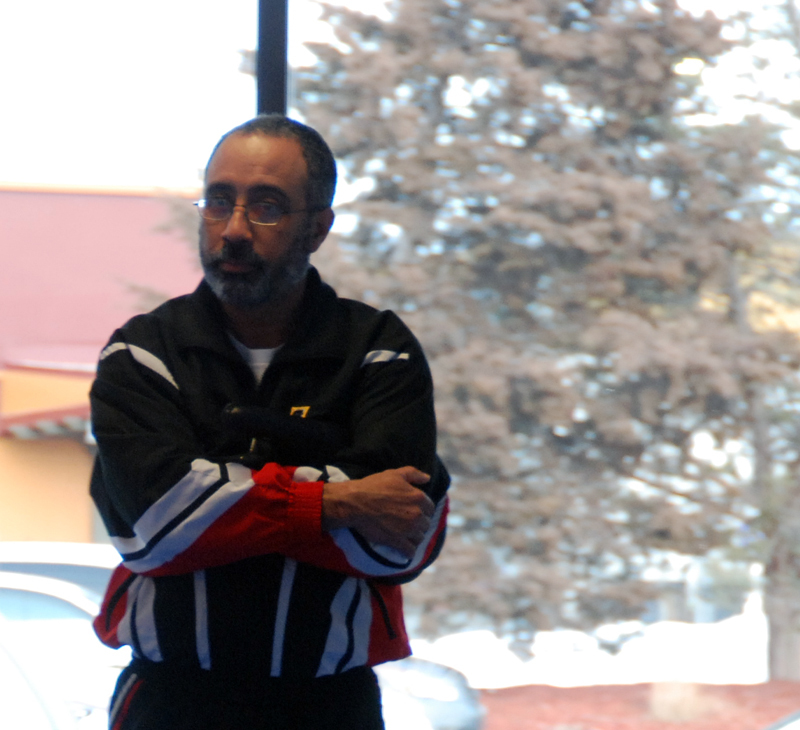 Another aspect of attitude is loyalty to the (Dojang) school, grandmaster, master and instructors. Students should maintaining the values of the school following rules and polices. Once it has been determined that the student has met all criteria for testing, the instructor will present the student with an “Intent To Promote” letter. This letter provides an opportunity for the student’s parents and teacher to supply valuable input concerning the student’s behavior and academic performance. This is importance because we strive to achieve excellence in all areas of our students lives. If you have concerns not addressed here, Master Angel is available for consultation, but please remember that he constantly evaluates students, and does not simply overlook students who may be ready to test. If you or your child is not scheduled to test, at least one of the three requirements above has not been met. Your instructors can only really influence the second factor, that of mastery. It is up to the student to be in class as often as they should be, and to have that A+ attitude! This rules & policies change from time to time, be sure to review them frequently.